To hell with history here! 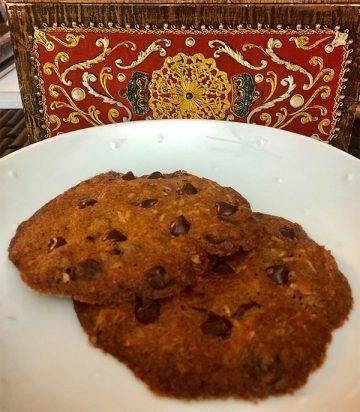 When it comes to things like Chocolate Chip Cookies there are memories that are much more indelible than the shifting and … floury in this case … ‘footprints’ of time. My first memories of chocolate chip cookies came within months of my first awakenings of …other things that culminated in the vocally non-alphabet constrained; groans, moans and sighs. I hope you understand where I’m coming from. It’s Philip Roth territory if I need to sketch it out further. These cookies were so much safer to spend time fantasizing about. Even more so because they were made by my sister Jane whom I loved, love and adored, adore. We all lived in a small, slightly crumbling stucco house in Northern Illinois. My Grandmother, Mother, two sisters and I. The place was originally built as a summer vacation home for a Chicagoan who would spend parts of June, July and August fishing in the beautiful lake behind us in the early 1940’s and 50’s. We took over the home after the break up of our mother and father in the mid 1960’s. Many of the homes were like ours, (airy cottages really), though ours was the only Spanish looking one. We didn’t have a television for the first year we lived there. A large radio sitting on top of the refrigerator brought us the inimitable voice of Paul Harvey. Good Day! It also brought us the Chicago Cubs baseball games and my New York transplanted grandmother, Nana became a quick fan of the ‘lovable losers’. Jane would just wreck me by having her cookie batter just hitting the well-seasoned stove’s griddle as I stiffly walked in from another cold walk home from high school. Our home was warm and chocolate scented. She enjoyed taking care of me in this ‘big sisterly’ way. Sometimes she switched up and used peanut butter and chocolate chips in combo. Oh my God! She would force me to wait at least a full 30 seconds before I could take them off of the wire trays and devour them even though the chips of chocolate would still be meltingly hot. O.K. Some history. We have learned that Ruth Wakefield was the inventor of the first chocolate chip cookie. It was around 1938. Are you ready for this? She worked as a dietician. In 1928 she and her husband bought a tourist lodge named ‘The Toll House Inn’ which was located about halfway between Boston and New Bedford. It was a place where passengers had historically paid a toll, changed horses and ate home-cooked meals. Ruth cooked and served all the food and soon gained local fame. Her chocolate chip cookies soon became very popular. She added chopped up bits from a Nestlé semi-sweet chocolate bar into a cookie. Bam! As one might say. During World War 2 US soldiers from the area Ruth cooked in stationed overseas shared the cookies with fellow G.I.s they received via ‘care packages‘ from back home with soldiers from other parts of the US. Soon, hundreds of soldiers were writing home asking their families to send them some ‘Toll House’ cookies. Wakefield was soon swamped with letters from around the world requesting her recipe. She eventually formed a business relationship with the Nestlé group. Had enough history? Me too. I need a glass of milk! Line two baking pans on a very lightly greased non-stick baking pans. In a mixer with a paddle, cream the butter and sugars until fluffy, 3 minutes or so. Add the eggs one at a time. Now add the vanilla. Add the flour mixture all at once and blend until a dough forms. Fold in the chocolate, coconut and pecans. Chill the dough. Roll 2 1/2 -tablespoon lumps of dough into balls, then place on the baking sheet and flatten to 1/2 -inch-thick disks spaced 2 inches apart. Chill the dough between batches. Bake until the edges are golden brown, 14 to 16 minutes. Let cool slightly on the baking sheet, then transfer to a baking rack. Makes 30 to 35 cookies. Preheat the oven to 350 degrees. Line two baking sheets with parchment paper or Silpat. Sift together the flour, baking powder, baking soda and salt. In a mixer fitted with a paddle, cream the butter and sugars until fluffy, 3 minutes. Add the eggs, one at a time, then the vanilla. Add the flour mixture all at once and blend until a dough forms. Fold in the chocolate and walnuts. Chill the dough. Roll 1/4 -cup lumps of dough into balls, then place on the baking sheet and flatten to 1/2 -inch-thick disks spaced 2 inches apart. Chill the dough between batches. Bake until the edges turn golden about 15 minutes.